An alert weather-watching Gurnite wishes to warn his fellow citizens of strong winds that are forecast for next weekend. 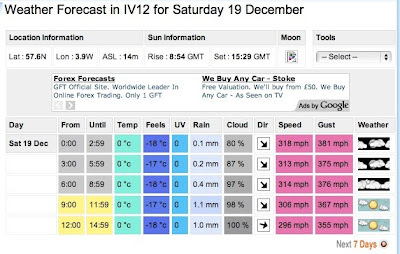 Hopefully the esitimates might be revised in the near future but if not it might be prudent to be careful on the way home from the pub next weekend if the forecast turns out to be accurate. Care would be needed in wind speeds such as those forecast. It would be absolutely critical to lower ones centre of gravity to withstand maximum gusts of up to 350mph. Perhaps I would even go so far as to recommend that only those with very short legs should venture out at all. Some of the figures given in the forecast are clearly wrong though - by my calculations, the windchill at 0 deg C, with a windspeed of a average 315mph is actually -87 deg C.
I blame it on the turkey's myself..! Care must be exercised when deciding the main course at the works xmas lunches. Certainly makes me windy anyway...!